glimpses of local ecology in action. In the first two sections we identified three types of ecological units and made lists of neighbours. What we brought into focus is static information, a snapshot of land and water, a catalogue of organisms. We assembled vistas. We arranged a still life. The next step is to animate these, to see these all in motion. The changing faces of land and water. For each ecological unit is actually a process, always becoming something else, on a scale and at a speed of its own. Neither the scale nor the speed are necessarily human, for all that we humans are involved. We cant quite see this in its entirety but we can glimpse some of the action. A place on the seashore is always in the process of becoming a somewhat different shore. A stream in a neighbourhood is always a changing pattern over the land. The river it flows into in the catchment may have banks which are forested or bare, exposed or flooded, varying over distance and over time. We can train ourselves to see these in action in our mind's eye by learning to read the lay of the land and the flow of water. Every place, neighbourhood and catchment expresses this as a text. They flaunt the clues and signs which tell of process. One way to focus our attention is to search for the following: how processes continue here, how they vary and what opportunities are expanding or contracting? see Monitoring and Surveys as Action Research and Employment Opportunities. And just as we can learn to see each ecological unit is a process, we also need to adjust our views of our neighbours. Those individuals of the many species around us are in relationships, which are at the heart of the processes of the land and waters. The focus of these relationships is on two critical features: subsistence and life cycles. Try the following activities to get a glimpse of these relationships in action. Subsistence: Pick four species (one of which is humans) which are important to your neighbourhood. Find the answers to these questions by making some detailed observations in local places: Where do they get the water they need? What condition is the water? What of food? Where does it come from? Is it enough? Where do they shelter? Is it safe? Where do they rest and enjoy? Are they often disturbed? How badly? And how do each of these species end up affecting each other? Where do they reproduce. How often? Where are the space and materials for the young as they grow? Where will they live as adults? How many actually grow up? How do they die: is there some pattern to the deaths? How is the pattern changing? 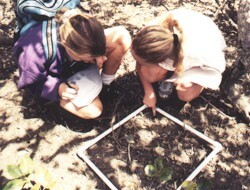 see Field Services and Monitoring and Surveys as Action Research. Much of the specific information about process and relationships is not known for most of our country. Not about many places. Nor about many species in these places. Not even that well about us humans in our own places. This local ecology is modern biology's most urgent task. Apathy. Cynicism. Old ways of thinking and acting. Where to begin with something new? How? Let's start here, right where we live, using this neighbourhood biology approach. We can take just one step at a time.